Signs and symptoms include sandy or itchy eyes and red or swollen eyelids. Blepharitis is a common and chronic inflammatory condition that affects the eyelids. It cannot be cured but it can be controlled, when you follow the advice of your eyelid specialist. There are different types of Blepharitis. Signs and symptoms may include sandy sticky or itchy eyes and red or swollen eyelids. Crusty or flaky skin may appear on the eyelids. 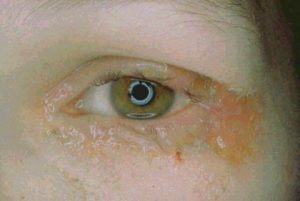 In severe cases, this condition may also cause cysts in the eyelid (chalazia), styes, irritation and inflammation of the cornea and conjunctivitis. However some patients may have no symptoms at all. Some types of Blepharitis (eg. Meibomian Gland Disease or MGD) can be linked to Dry Eye Disease (DED). In certain cases there may be excessive watering around the eye. Blepharitis can be controlled to a significant extent. 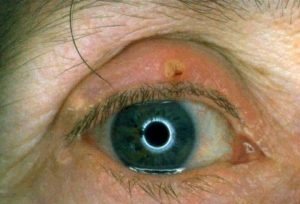 The treatment will depend on the type of blepharitis and the severity of the patient’s symptoms. Often Dry Eye disease may need to be treated at the same time. Anterior blepharitis may be controlled with eyelid hygiene (cleaning the eyelid margins with cotton buds dipped in dilute sodium bicarbonate or shampoo) to remove crusting. MGD / Posterior blepharitis may be improved by warm compresses. A tailored treatment schedule may involve the use of topical anti-inflammatory drops and tear supplements as well as systemic treatment. Note: All treatment is preceded by a consultation and examination to establish the correct diagnosis.